Surface preparations set the foundation for stable and permanent colour applications by sealing and adding tooth to almost any painting surface. We offer five different types of prep products available to accommodate all types of work. Surface Preparations are used to seal, prime and add tooth (for colour adhesion) to all surfaces such as canvas, wood, paper and metal. This same preparation is used for both acrylic and oil paint. Our professional gessoes usually take just 1 coat. The classic white sealer and ground for absorbent surfaces, such as canvas, paper or wood. Provides the proper surface sizing, tooth and absorbency for acrylic and oil paints. One coat is usually enough. Traditional gesso is meant to be opaque titanium white for good coverage. Two coats are recommended under oil colour. Liquitex Gesso is a premium acrylic gesso used to prepare painting surfaces for acrylic and oil paint. Provides the perfect "tooth" and adhesion to a wide variety of supports such as canvas, paper and wood. Excellent base coat primer for many applications such as murals. One coat is usually enough. Use undiluted or thin up-to 25% with water. When thinning more than 25% use an equal mixture of water and Liquitex Matte Medium to thin gesso. Tint colour with Liquitex Medium or Heavy Body Artist Colours. 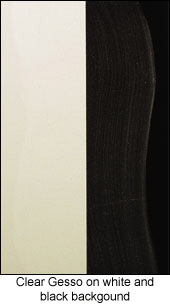 Liquitex Coloured Gesso is hue balanced and all colours are intermixable to provide a wide variety of coloured grounds. A very clear size and ground that keeps the working surface visible. Clear gesso provides an ideal degree of tooth for pastel, oil pastel, graphite and charcoal as well as an excellent ground for acrylic and oil paints. This gesso is ideal for painting over coloured or patterned surfaces or over an under drawing. 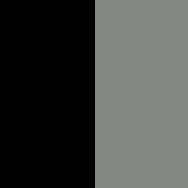 Mix with a colour to establish a tinted transparent/translucent ground. Dries clear to translucent depending on thickness. One coat is usually enough. Liquitex Clear Gesso is a very clear size and ground that keeps your working surface visible. Excellent ground for acrylic and oil paint. Mix with acrylic colour to have a tinted ground. Dries clear to translucent depending on thickness. Flexible, non-cracking and non-yellowing when dry. For canvas, paper, wood, or any clean, porous, non-oily surface. Sizes and primes while maintaining the original appearance of the support. Provides paper with good tooth for chalk and oil pastel techniques. Mix with a very small amount of transparent or translucent acrylic colour to tint the ground while maintaining transparency. Liquitex Super Heavy Gesso is an innovative, impasto acrylic gesso used to prepare painting surfaces for acrylic and oil paint. Tint colour with Liquitex Soft or Heavy Body Artist Colours. Establishes a colour ground while providing all the attributes of traditional acrylic gesso. Some artists like to start their work on a coloured ground to reflect the painting process in a different way. One coat is usually enough. 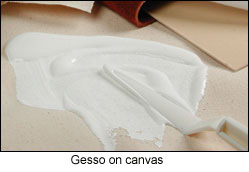 As with traditional gesso, coloured gessoes also give opaque surface coverage. Liquitex Coloured Gesso is the premium acrylic gesso used to prepare painting surfaces for acrylic and oil paint. Use undiluted or thin up to 25% with water.